Our crazy little creche on our fireplace is an oddball mixture of the mass-produced and predictable along side the delightful finds from somewhere on our travels. At the core are a manger, Joseph, and Mary that are made in plaster. The plaster baby Jesus showed up on Christmas morning, having spent the past few weeks in hiding behind the manger. The Magi are off to the side of the mantle, slowly but surely making their way to a January 6 Epiphany appearance, on the Twelfth Day of Christmas. Meanwhile, a zoo of sorts sits around the scene. There's the glass camel Christmas ornament that we found in Luxor, Egypt. There's a clay Pucara bull from Cuzco, Peru that we found after our hike to Machu Picchu. The little Dala horse that I got during a winter visit to Stockholm, Sweden watches over the baby. An African giraffe and zebra from Ten Thousand Villages are perched beside the creche. A disproportionately large terracotta horse from Xian, China towers over the plaster sheep. And scattered around this scene are angels from so many places and St Nick, historically and literally from Turkey. So many shopping finds. 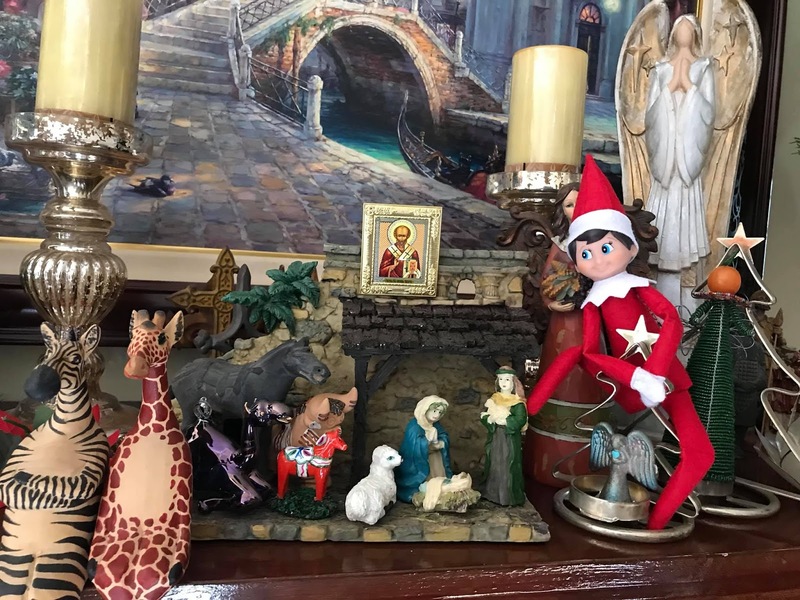 It occurred to me that though we purchased the animals or were given all these angels, they represented joyful moments that delighted us or the person who gave them to us. The discovery of these individual creatures brought pleasure. And I totally enjoy bringing this weird assortment of characters together as our nativity scene every year. I was pondering about why I liked doing this. I giggle every time I see that fireplace this time of year. One aspect is that it's bringing unexpected things together to tell a story. But I think what makes it particularly enjoyable is that these finds are positioned by us to tell a story about the greatest find: the finding of the baby Jesus. They are in a story about finding something joyful in unexpected places. They are literal store finds in a representation of the great finding. And when the Magi appear at this nativity scene, the finds get wackier. Because multiple nativity sets have come and gone over the years, we have a baseball team of plaster Magi. Added to the caravan is a wooden Don Quixote from Avila, Spain (as in St Teresa of Avila). And the nested dolls from Russia, deliberately unnested as the women search for Jesus. And so on and so on. All that searching, seeking, yearning. All that finding. All around the discovery of a newborn baby. Joy sometimes comes both in the finding and in the struggle to find. This past Christmas day, we spent the morning with Stephen's family. Then, mid-day, we headed an hour away towards San Diego where my parents were visiting my sister in Murietta for the week. It was a big family coming together from miles around to spend the afternoon and evening together. My sister's twin boys came from Northern California to surprise their grandparents and sister. She hosted a feast for us all, and my parents got to watch their large family playing games, breaking bread (or pancit), and telling stories. When Stephen and I got home late that night, we opened our own gifts to each other and went to bed. We never heard the phone ring. When I awoke the next morning, I listened to a voice mail message and read countless texts from my nephews and sister that my mom had fallen in the middle of the night and they had to take her to the emergency room. They found my mom in the bathroom, blood everywhere as she gashed her head on the corner of the wall. As dawn approached, after a CT scan showed she was fine, they were able to return home, a little scared, a little relieved, a whole lotta tired. I cannot imagine my niece finding my mom like that, as unlike me, she's never worked in a hospital. I heard the fear in her voice when we spoke. My mom, though, says that she wasn't scared. She wondered if this was the end, but she wasn't frightened. She couldn't stay awake so perhaps she was unable to process what was happening from an emotional level. She was relieved they heard her fall, had found her, had lovingly cared for her. My Dad was thankful that the family was around to help. I suspect that it's not normal to compare the finding of a newborn baby, the incarnation of love and life, to finding a mom bleeding on the floor, but I felt the connection nonetheless. There's a lot to think about when so much happens in such a short time. My mom is in her 80s now and needs to remember to use her cane, especially when she's tired, in an unfamiliar setting, when she's alone. We wonder sometimes how long we'll have her and pray that it'll be for many more years, but we know we can't control it. My family found her, lying in blood, in a humble room like a bathroom, with fear, with love. They wondered if this was the end. She's fine now and we pray we can enjoy our time together as best we can. Jesus was found with Mary. It was probably messy, bloody, scary. Mary was tired and in an unfamiliar setting. She knew that the baby was to be called Jesus ("God Saves" in Hebrew) and perhaps wondered how long she would have him, knowing she didn't control it. In a humble place, she gave birth to love. She and Joseph probably wondered what this beginning would bring. Jesus the baby was safe in their arms and they probably enjoyed their time together as best they could. Joy comes unexpectedly. Sometimes there's anticipation, sometimes there's sheer surprise. Sometimes we have to go out of our way to arrange the figures in our life to bring joy to us. Sometimes we walk miles, sometimes we walk down the hall. Sometimes we just sit in the emergency room or in a manger, waiting for word, waiting for Good News. We cannot make joy appear. We can only position ourselves, orienting our hearts and minds in a way that gives us the opportunity to see it, feel it, grasp it in our hands. Whether we grasp the hand of a baby, or grasp the hand of an older parent, we cannot make ourselves joyful at what we have. We can only be open to it. Be ready for it. Many times, we walk away in horror, sadness, brokeness, when what we hoped for and what we yearned for does not happen. Our need for joy, for unending love, of inter-relatedness, can suffocate under the realities of our mortal lives. We don't always get what we want. We can't force a fairy-tale ending to every story. Yet we can still hope, because the promise of Christmas was fulfilled. In the worst circumstances, there's always a chance for hope. And even if things turn out badly, we dive deeper into what things matter most, because at one time we had found love, we saw it, we touched it. So when the unthinkable happens, when the fears and the exhaustion and the tears build up inside you threatening to bring you down, remember that you can still be surprised. You can still discover Good News in the most unlikely of places. You can orient yourself to the star of the east buried in your heart, perhaps while the tears are falling from your face, and offer a precious place, a humble place, for joy to be born. And maybe, just maybe, joy can find you. My mom had a similar midnight bathroom fall over the summer. On the plus side, my brother's family was there and my sister-in-law is an MD. On the minus side, my mom's injury was more serious and she spent several weeks in the hospital and rehab center. Scary times indeed. Oh my! I've heard of more than a few people in the past couple years who died after falling down. It's indeed scary and it can help us understand how to better care for families. I hope that your mom is better today Bob. Thank you for sharing your mom's story.